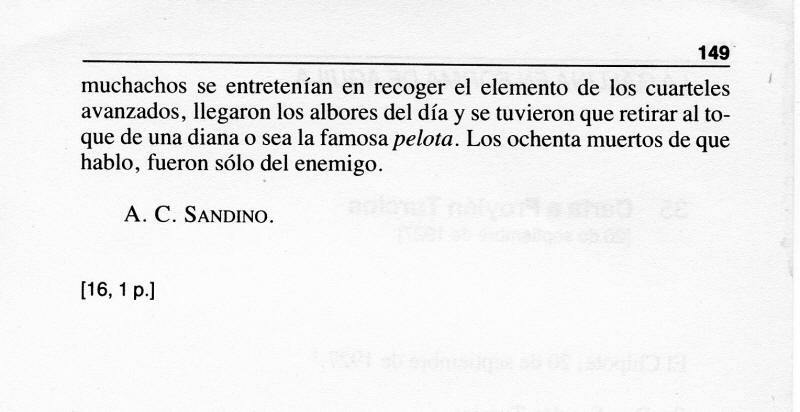 Also included here is Sandino's official account of the battle; a news clipping on the event from the Managua daily Diario Moderno; a fragment of an anonymous diary by one of the Sandinista attackers; and an excerpt from a Marine-Guardia intelligence report before the event. At the bottom of the page is a space for readers who would like to comment and offer their own interpretations of these textual windows into these dramatic events. Many thanks to Imara Gabuardi Pérez, attorney and notary public in the Republic of Nicaragua, for her translation of these documents, and to Clemente Guido and the Alcaldía de Managua for facilitating and providing the translations. Además, está incluido un recuento oficial de Sandino sobre la batalla; un relato de los eventos del diario de Managua Diario Moderno; un fragmento de un diario anónimo de uno de los atacantes sandinistas; y un extracto de un informe de inteligencia de los Marine-Guardia antes del evento. En la parte inferior de la página queda espacio para los lectores que quieren hacer comentarios y ofrecer sus interpretaciones de estas ventanas textuales en estos acontecimientos dramáticos. Muchas gracias a Imara Gabuardi Pérez, abogado y notario público de la República de Nicaragua, por su traducción de estos documents, y a Clemente Guido y la Alcaldía de Managua por facilitar y proporcionar las traducciones. Click on thumbnail above for enhanced large-scale image (200 dpi). Map of events of 19 September 1927 by USMC First Lt. and GNN Captain H.S. Keimling. Source: Record Group 127, Entry 38, Box 30 (RG127/38/30), U.S. National Archives & Records Administration (NARA), 700 Pennsylvania Ave NW, Washington, D.C., 20408. 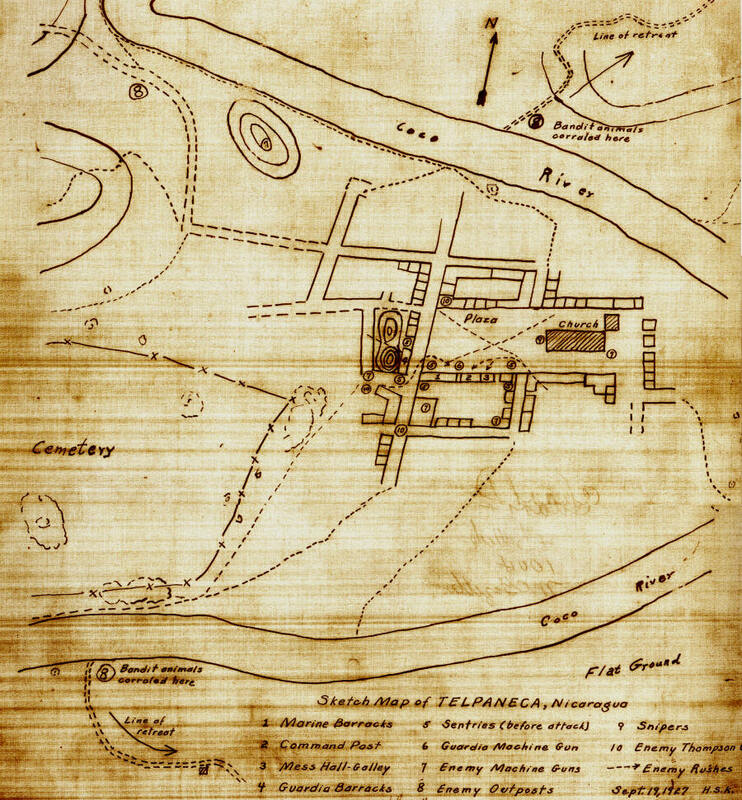 At 1.00 a.m. two hundred bandits led by Salgado attacked the combined forces of Marines and Guardia at Telpaneca. This garrison consisted of a total strength of twenty enlisted Marines and twenty-five Guardia, under command of Lt. Keimling. The battle started at close quarters and continued so far about four hours. The casualties wer Pvt. Lenton C. Russell, USMC., killed, Pvt. James S. Glasser, mortally wounded and one Guardia seriously wounded. 19 de Septiembre de 1927. A las 1.00 de la madrugada doscientos bandoleros dirigidos por Salgado atacaron las fuerzas combinadas de Marines y Guardia en Telpaneca. Esta guarnición consistía en una fuerza total de veinte soldados y veinticinco guardias, bajo el mando del teniente Keimling. La batalla comenzó de poca proximidad y continuó hasta ahora unas cuatro horas. Las víctimas fueron Pvt. Lenton C. Russell, USMC., matado, Pvt. James S. Glasser, herido mortalmente y un Guardia gravemente herido. To: The Commanding Officer, Fifth Regiment. 1. At 1:00 a.m., 19 Sept., 1927, two hundred bandits led by Salgado attacked the combined forces of Marines and Guardia at Telpaneca. This garrison consisted of twenty five enlisted Guardia and twenty enlisted Marines, with First Lieutenant Keimling, U.S. Marine Corps, now on duty with the Guardia Nacional, as the only officer. 2. The attack started by a bandit coming into the door of the Marines quarters and emptying a Thompson gun into the bunk of Private Russell, who was instantly killed. The night was extremely dark and foggy and the bandits were at close quarters before observed. In fact there was no alarm until the bandits started firing into the barracks buildings at close range. 3. It is believed that the attackers had one Lewis machine gun, three Thompsons, numerous home-made dynamite bombs, and the balanced armed with rifles and machetes. 4. The fighting lasted at close quarters for about four hours and at 5:00 a.m., the bandit bugler blew retreat. The battle discipline of the bandits was excellent in that they attacked in two ways, one wave of riflemen and one of machete men. It is apparent that a large number of the attackers were drunk, this accounted for their close fighting or otherwise they would not have had the nerve to come in close. 6. The first objective of the attackers was the Guardia and this newly organized Guardia Detachment acquitted itself in an excellent manner. At one time during the fight, the bandits at the rear wall of the guardia barracks tried to get the guardia to desert to their side and help the bandits clean out the Marines; the guardia's only answer was another volley. One guardia picked up a bomb that was thrown in the guardia compound, heaved it over the fence, stepped around the corner and killed the bandit who threw the bomb. One other guardia disguised in civilian clothes, left Telpaneca at about five a.m., and brought to Pueblo Nuevo the first news we had of the attack; he arrived here at 1:00 p.m., 19 September, and at 2:00 p.m., insisted on returning to Telpaneca with my relief. Enroute to Pueblo Nuevo this same Guardia brought five Guardia mules about half way and left them in a portrero [potrero, pasture] for safe keeping so the bandits would not get them, then walked the balance of the distance. Another Guardia carried orders from Keimling from building to building throughout the entire battle exposing himself to the enemy fire. Separate reports and recommendations in these cases will be submitted later. 7. As for the conduct of the Marines, they fought like Marines always fight, nothing more need be said. 8. Five Guardia animals were killed by bandits and have no exact [information] yet as to how many are missing; the portrero [potrero] is in such a location as to be impossible to guard during an attack. The bandits cut the wire fence of the pasture thus allowing the animals to wander through the town during the battle. 9. Lieut. Keimling and the entire garrison is to be commended for their courageous and effective defense against large odds and a surprise attack. A: El Comandante del Quinto Regimiento. 1. A las 1:00 de la mañana, 19 de septiembre de 1927, doscientos bandoleros dirigidos por Salgado atacaron las fuerzas combinadas de Marines y Guardias en Telpaneca. Este regimiento constaba de veinticinco Guardias enlistados y veinte soldados de la Marina reclutados, con el teniente primero Keimling, del Cuerpos de la Marina de los Estados Unidos, ahora en servicio con la Guardia Nacional, como el único oficial. 2. El ataque comenzó cuando un bandido entró en la puerta de los cuarteles de los Marines y disparo un cañón Thompson en la litera del soldado Russell, quien fue asesinado instantáneamente. La noche era extremadamente oscura y brumosa, y los bandidos estaban a poca distancia. De hecho, no hubo alarma hasta que los bandidos comenzaron a disparar contra los edificios del cuartel a corta distancia. 3. Se cree que los atacantes tenían una ametralladora Lewis, tres Thompsons, numerosas bombas de mano de dinamita hechas en casa (hechizas) y hombres armados con rifles y machetes. 4. La lucha frente a frente duró por cuatro horas, y ya las cinco de la mañana, el clarinero de los bandidos tocó la retirada. La disciplina de batalla de los bandidos fue excelente dado que atacaron de dos maneras, un grupo de fusileros y uno, con hombres con machetes. Es evidente que un gran número de los atacantes estaban borrachos, esto explicaba su lucha cercana o de otra manera no tendrían el valor de acercarse. 5. Un gran número de muertos y heridos fueron removidos por los bandidos antes de retirarse, pero una estimación conservadora de sus pérdidas fue de veinticinco muertos y cincuenta heridos. 7. En cuanto a la conducta de los infantes de la Marina, lucharon como los infantes de Marina siempre luchan, no hay más que decir. 8. Cinco animales de la Guardia fueron asesinados por los bandidos y aún no hay exactitud [información] sobre cuántos están desaparecidos; El potrero [potrero] se encuentra en un lugar tal que es imposible vigilar durante un ataque. Los bandidos cortaron los cables de la valla del pastizal, permitiendo así a los animales deambular por la ciudad durante la batalla. 9. Teniente Keimling y toda la guarnición debe ser elogiado por su defensa valiente y eficaz contra gran disparidad, (y) de un ataque sorpresa. All Marine-Guardia reports on this page are housed in Record Group 127, Entry 212, Box 1, and RG127, Entry 113C, Box 12, US National Archives, Washington D.C.
At or about one a.m., 19 Sept 1927, Bandit groups numbering about 200 under the command of Colindre [Juan Gregorio Colindres], Estrada [Francisco Estrada], Salgado [Carlos Salgado], Diaz [José León Díaz], Tomas Migado [Tómas Melgara? ], Sanchez [Porfirio Sánchez], Rameriz [Ramírez], attacked Telpaneca. Town was blanketed by a heavy fog which permeated through the buildings. Sky dark over cast with heavy thundering. Battle stations were taken immediately after explosion of dynamite bomb in rear of Marine quarters. Pvt. Irwin sentinel in rear of Marine Quarters killed the bandit as he ran after setting off bomb. Bandits laid heavy rifle, Lewis Machine gun and subthompson gun fire on the rear of marine and Guardia Quarters followed by dynamite bombs and hand grenades. The front of the Quarters was peppered by sub-thompson fire followed by rushes by riflemen with machete men in rear of them. Two groups rushed right up to the doorway of the small buildings occupied by the cooks & messman and the office building in which the undersigned resided. As I was rushing out of the doorway of the office building which was designated during the attack as the Command Post Sgt Eadens shoved me back saying "Here they come" and shot the bandit whose rifle was pointed at me. As the bandit staggered back he shot Pvt. Glaser U.S.M.C., who was going to his battle station. Pvt. Irwin coming up in the rear of Pvt. Glaser shot up the rest of the group of the bandits. Sub-thompson fire was directed on us. Pvt. Glaser staggered as Sgt. Eaden and I grabbed him and dragged him into the office. Pvt. Glaser received some more bullet wounds while we dragged him in. Sgt. Eaden and I worked in reliefs guarding the door and bandaging and attending the wounded man. I told Sgt. Eaden to take charge & guard the front as I was going to give some information to my Marines and Guardias. I first ordered them to fire faster, appointed men in different parts of the Marine and Guardia Quarters to take command in my absence & to let the men fire as fast as possible for ten minutes and then to fire at flashes caused by their rifle fire and to impress on the men to aim and conserve their ammunition. After the first fifteen minutes everybody settled down and shot like veterans. The Marines & Guardias had excellent fire control and discipline. Directed Pvt. Macon the Lewis Machine Gunner to use traversing fire across the plaza. While I was along side of Pvt. Morris he said "Look at the bozo coming down the hill, skipper". We watched the Bandit throw something in the Guardia Quarters & next instant it was thrown out by Raso Salamanca who then shot the bandit. Another form was seen moving down the hill but no Marines fired as they each had their own sector and would have fired into the Guardia Quarters. Raso Cuena GNN got mad at all the bombs exploding around his battle station so he proceeded to leave the building under heavy fire and shot the next bomb thrower coming down the hill receiving a slug in his foot in return. The bandit kept going towards the Lewis Machine Gun emplacement to drop his bomb when Pvt. [ p. 3 ] the enemy's rifle flashes. Told Pvt. Morris to get an automatic rifle and clean up the outside of the rear of the Marine Quarters as I suspected some bandits who had sneaked up in the beginning of the attack were there and could not get away. Out of the door he went unconcerned to the enemies fire, accomplished his mission and returned. Over the the Guardia Quarters I saw Raso Rafael Romero (cook) while under fire keeping the Guardia Detachment well supplied with hot coffee. I believe I have overlooked a number of heroic deeds and cannot express myself enough to do justice to the bravery of the Telpaneca Detachment. Enemy 25 killed & 50 wounded. The following are recommended for Guardia Medals, promotion and cited for bravery in battle with bandits.
" Juan T. Altamirano - "
" Adan Centeno - "
" Francisco Canales - "
" Hernesto Centillo - "
" Alberto Cheves - "
" Diego Condega - "
" Miguel Jeres - "
" Octavio Mejia - "
" Ofilio Medina - "
" Alejandro Rodriguez - "
" Miguel Savala [Zavala] "
Sgt. Eaden, A. recommended for Congressional Medal of Honor, - rescuing wounded Marine under fire - repairing Lewis machine while exposed to enemy fire, bravery during battle. Recommend Sgt. Eaden be promoted to Gy [Gunnery] Sergeant. Pvt. Glaser, James Stephen while mortally wounded tried to use his rifle on the enemy with one hand after the other was shattered by bullet wound, staggered towards his battle station with grim determination. When he heard a subthompson jammed and he was lying mortally wounded on a bunk Glaser requested his rifle be used. Recommended for Navy Cross.
" Isdell " " "
[ pag. 2] Morris gritó "¿Quién es? Un Guardia?". Raso Luis Huerta dijo: "No, una bandito (bandido)". El cabo Morris lo dejó tomarlo y el ametrallador terminó con. Fui llamado al puesto de mando. Llegue [allí] a tiempo para lanzar algunas granadas a un grupo haciendo una carrera bajo el fuego dirigido a la parte posterior del puesto de comando. Varios grupos de bandidos dispararon bajo orden e hicieron algunos muy buenos disparos. Fui informado que la ametralladora Lewis estaba atascada. Antes de que pudiera decir una palabra, el sargento Eaden me dio su rifle y dijo: "Capitán, guarde la puerta, yo la arreglaré" y lo hizo a la intemperie bajo fuego, sin refugio alguno. El artillero agarró su propio rifle disparando fuego rápido tratando de iniciar la ametralladora Lewis. Entonces algunas de las subtompsons empezaron a dar un poco de problema, el Sargento Eaden iba y las despejaba cada media hora hasta llegar la mañana. No hubo problemas después de eso. La niebla empezó a subir a las 2:30 am y se puso más ligera alrededor de las 4 de la mañana. Todo estaba en silencio a las 5 de la mañana. Investigaciones y búsquedas en la ciudad demostraron que una subtompsons se operaba desde la plaza frente al Cuartel de la marina, una del lado este de la iglesia, dos desde cada lado de las esquinas de las calles y hacia la parte posterior de la Guardia y Cuartel de los Marines, otra fue operada en una subida ligera hacia el suroeste del cuartel de la Guardia. Pasé la palabra siempre que era posible saltar un subthompson si estaba lo suficientemente cerca. Actuando el Cabo Justo Salamanca, Rasos Luis Huerto, Luis Sánchez y Salomón Cortés saltaron la subthompson que operaba contra su cuartel pero tuvieron que retirarse cuando un grupo los atacó con granadas de mano. Ellos cumplieron su misión cuando la thompson fue retirada de ese sector. El infrascrito cree que los bandidos tenían 3 subthompsons y las movieron de un sector a otro. Una Lewis fue operada cerca de un edificio al sur de la Marina y el cuartel de la Guardia. Otra fue operada desde la colina en la carretera principal a 300 yardas de la ciudad (de Norte a Oeste). Los bandidos tenían alrededor de 140 hombres en el ataque principal contra los Cuarteles del Destacamento. Otros grupos fueron colocados en todas las carreteras y senderos que conducen a la ciudad. Una reserva general estaba con todos sus animales en el otro lado del Río Coco Sureste de 40. El enemigo comenzó a retirar a sus muertos y heridos alrededor de las 3 de la madrugada. Los hombres encargados de los rifles (fusileros) de los enemigos entraron a la batalla con cerca de 50 cartuchos de amuniciones por pieza. Las líneas generales de retirada de los enemigos eran desde el noreste y el sureste de 40. Se registraron casas y se encontraron varias bombas de dinamita y granadas de mano. El rango de dinamita de las bombas era entre de 24 a 26 cartuchos de dinamita. Todas las municiones y explosivos de los enemigos arrojados en el Río Coco. Dos bombas de dinamita fueron lanzadas sobre del techo en la parte trasera del cuartel de la Guardia. El Raso Pedro Saballos tiró una de las bombas del edificio recibiendo heridas en su mano de la explosión de la misma. Un Guardia desconocido lanzó la otra para que los bandidos no escucharían mis órdenes a la Guardia. Pasé la palabra al Raso Luis Huerta para que informará al Puesto de comando. Lo cual hizo bajo fuego intenso. Envié a Raso Huerta varias veces con mensajes verbales a mis Guardias. Siempre regresaba con una sonrisa. Entonces lo puse a cargo de vigilar el frente del Puesto de comando y cuidar a los marinos heridos hasta que llegara. Encontré a todos en el puesto y en el mejor de los espíritus, haciendo bromas y disparando a las chispas de los disparos de los enemigos. [Página 3] Le dije al cabo Morris que tomara un rifle y despejara las afueras de la parte trasera del cuartel de la Marina debido a mis sospechas de que algunos bandidos se habían filtrado desde el comienzo del ataque y podrían estar ahí y no habrían podido salir de ahí. Fuera de la puerta, este partió sin estar apercibido del fuego enemigo, completo su misión y regreso. En el cuartel de la guardia mire al raso Rafael Romero (el cocinero) quien mientras estaba el fuego abierto mantenía al destacamento de la guardia bien provisto con café caliente. Creo que he pasado por alto una serie de hechos heroicos y no puedo expresarme lo suficiente como para hacer justicia a la valentía del Destacamento de Telpaneca. Enemigo 25 muertos y 50 heridos. Los siguientes son recomendados para Medallas de La Guardia, promocionados y citados por valentía en la batalla con bandoleros. STATEMENT OF SGT. ALVA EADENS. At 1:00 A. M. 19 Sept. 1927 while the Det. was sound asleep and the night so dark that one could not see farther than five to ten feet outside the doors. I was awakened by a very loud explosion only a few yards from the barracks, I jumped out of my bunk and grabbed my rifle and started to the front door to go to the main Bks. next door but when I reached the door I saw a man armed with a rifle peeping towards the storeroom where the cooks and messman were. I shouted to them of the danger and about that time the bandit turned toward me and beckoned to a group of bandits in his rear who I could hear talking in spanish. I immediately fired but he did not fall - only staggered and ducked around the corner before I could reload and fire again. That put a stop to them rushing in from the front side. That same man had already fired a couple of shots into the storeroom, killing Pvt. Russell. While I was crouched there waiting to see if any more of them were coming back, Capt. Keimling of the G. N. who was sleeping in the same office where I was, ran out through the door by me to shout out some commands and words of cheer to his men of the Guardia Nacional also the same to the Marines in the main Bks. When he came back in the office, the enemy fire was getting very heavy in rear of quarters (many bombs exploding a few yds from the doors). He took a couple of hand grenades and stood in the door, exposing himself to a very hot rifle fire and to the explosion of the bombs and threw the two grenades in different directions to prevent a machette attack; from time to time he did this. I believe they would have rushed in on us only for that. He kept all the marines and men of the G. N. cheered up throughout the night by joking and cheering them along and keeping them posted on the hour of the night. We were completely surrounded snipers equipped with rifles, and on the hill to our west not more than two hundred yds. away a machine gun was firing, also another about 100 yds. away from us, but all conciled [concealed], either inside buildings or behind corners of them. In one house about twenty or thirty yds. from the back door of the main Bks. there seemed to be about fifteen or twenty men congrigated [sic] with rifles and machettes: The machette men were whetting and banging their machettes against the wall and inside of building and shouting in spanish, this for the Marines. And about thirty or forty yds. from one galley there seemed to between thirty and fifty more of them - most of the bombs came from this place. [p. 2] all they could to help us out. One of the bandits ran down the hill passed the G. N. carrying a bomb consisting of 24 sticks of dynamite, he was hit by the G. N. causing him to drop the bomb, but he kept running in our direction, Pvt. Morris asked if he was one of the G. N. one of the G. N. immediately replied no, so Pvt. Morris with his rifle and Pvt. Macon with the Lewis M. G. both fired at him, bringing him down about 14 yds. in front of them. Pvt. Glaser and Pvt. Russell did not participate in the fight more than two or three minutes, as the latter was hit the first shot after the bomb gave the alarm, he only fired three shots after he was hit, then he was hit again putting him out of the fight, Pvt. Glaser was hit while passing from barracks to office also while enter the office, therefore he did not do any firing at all. When I left the office, there were only Lt. Keimling, Pvt. Irwin and Pvt. Foote left to defend it but they certainly did it well. Lt. Keimling guarded the front door at the same time passed out information to the marines and Guardia as to the locations of different machine guns and snipers also urging them to be careful with the ammunition and not waste it. Pvt. Irwin and Pvt. Foote were taking good care of the rear door, Pvt. Foote shouting come on you bandits, come out and fight. All men did excellent in obeying commands. DECLARACIÓN DEL SARGENTO ALVA EADENS. A las 1:00 A. M. del 19 de Septiembre 1927 mientras que el Destacamento estaba profundamente dormido y la noche tan oscura que no se veía más allá de cinco a diez pies de las puertas. Me despertó una explosión muy fuerte a sólo unos metros del cuartel, salté de mi litera y agarré mi rifle y empezó desde la puerta principal hasta los cuarteles principales de al lado, pero cuando llegué a la puerta vi a un hombre armado con un rifle que miraba hacia el almacén donde estaban los cocineros y el mensajero. Les grité a ellos del peligro y en ese momento el bandido se volvió hacia mí y llamó a un grupo de bandidos en la parte trasera a quienes podía escuchar hablando en español. Inmediatamente disparé pero él no cayó - sólo se tambaleó y se agachó en la esquina antes de que pudiera volver a cargar y disparar de nuevo. Eso les impidió entrar por la parte delantera. Ese mismo hombre ya había disparado un par de tiros en el almacén, matando al soldado raso Russell. Mientras yo estaba agachado esperando a ver si volvían otros, el Capitán Keimling de la G.N. quien estaba durmiendo en la misma oficina donde estaba yo, salió corriendo por la puerta a mi lado para gritar algunas instrucciones y palabras de motivación a sus hombres de la Guardia Nacional también lo mismo a los Marines en los cuarteles principales. Cuando regresó a la oficina, el fuego enemigo se estaba poniendo bastante pesado en la parte trasera de los cuarteles (muchas bombas explotando a pocos metros de la puerta). El tomó un par de granadas de mano y se paró en la puerta, exponiéndose al fuego muy intenso de los rifles y a la explosión de las bombas, y lanzó las dos granadas en diferentes direcciones para evitar un ataque con machete de los bandidos; De vez en cuando hacía esto. Creo que se habrían precipitado (los bandidos) sobre nosotros sino hubiese sido por esto. El mantuvo a todos los marines y hombres de la G. N. animados durante toda la noche bromeando y animándolos a lo largo de las horas de la noche y manteniéndolos informados de las horas. Estábamos completamente rodeados de francotiradores equipados con rifles, y en la colina a nuestro oeste no más de doscientos metros de distancia, una ametralladora disparaba, también otra cerca de unas 100 yardas de distancia de nosotros, pero todos nos cubrimos, ya fuera dentro de los edificios o bajo las esquinas de los mismos. En una casa, alrededor de unos 20 a 30 yardas de la puerta trasera del Cuartel Principal, parecía haber alrededor de 15 a 20 hombres concentrados con rifles y machetes: Los hombres con machetes estaban afilando y golpeando los machetes contra las paredes dentro del edificio y gritando en español eso a los marines. Y alrededor de 30 o 40 yardas, de una de las galeras parecía haber de entre 30 a 50 más de ellos – la mayoría de las bombas venían de ese lugar. Todo esto no desmoralizó a los Marines ni a la Guardia, sólo les hizo pelear más fuerte, gritándoles a los bandidos, diciéndoles que vinieran, ellos querían alcanzarlos con un disparo libre. Algunos de ellos estaban lo suficientemente nerviosos como para intentarlo, se arrastraron a menos de quince o veinte pies de nosotros antes de que los descubriéramos, pero tan pronto como fueron descubiertos por cualquier individuo, todos éramos inmediatamente notificados de ello y todas concentraríamos el fuego en ese punto. Todos juntos, como hermanos. La G. N. luchó como los Marines e hicieron todo lo posible para ayudarnos. Uno de los bandidos corrió por la colina pasó por la G. N. llevando una bomba que consistía en 24 cartuchos de dinamita, fue atropellado por la G.N. causando la caída de la bomba, pero siguió corriendo en nuestra dirección, el Raso Morris preguntó si era uno de la G.N. inmediatamente respondieron no, por lo que el Raso Morris con su rifle y el Raso Macon con la Lewis M. G. dispararon contra él, llevándolo a unos 14 metros en frente de ellos. El Raso Glaser y el Raso Russell no participaron en la pelea más de dos o tres minutos, ya que este último fue alcanzado por el primer disparo después de que la bomba dio la alarma, sólo disparó tres tiros después de que fuera impactado, luego fue impactado de nuevo poniéndolo fuera de combate. El Raso Glaser fue herido al pasar del cuartel a la oficina también al entrar en la oficina, por lo tanto, no hizo ningún disparo en absoluto. Cuando salí de la oficina, solo quedaba el teniente Keimling, Raso Irwin y el Raso Foote para defenderlo (el cuartel), pero ciertamente lo hicieron bien. El teniente Keimling guardó la puerta principal al mismo tiempo pasó información a los marines y Guardia en cuanto a las ubicaciones de las ametralladoras y los francotiradores, también les instó a tener cuidado con las municiones y no desperdiciarlas. El Raso Irwin y Raso Foote estaban cuidando bien la puerta trasera, Raso Foote daba gritos a los bandidos, “vengan, salgan y luchan”. Todos los hombres hicieron un excelente trabajo obedeciendo las órdenes. STATEMENT OF CPL. F. CARLSON OF THE BATTLE OF TELPANECA. On the morning of Sept. 19, 1927, I was asleep in the main barracks. I was awakened by an explosion of a bomb which I've learned later to be a hand made one (dynamite bomb). I jumped up and put my clothes on to cover my white underwear, and grabbed my rifle and ammunition, and made a break for my battle station which was two room's below the main barracks, exposing myself to the enemy fire. As I jumped in the room, and the men were at their battle stations keeping the men way with their fire. One of the men said to me, Pvt. Russell was shot, but no one knew how bad he was hit, a few minutes later we found out he was dead. Pvt. Nichols and I were stationed by the front door facing the plaza, we were kept busy by pot shooting at the enemy snipers, who were in the church and trees. At one off the building off the north west corner off the plaza their was one Lewis machine gun firing in burst at the three buildings which were occupied by the marines. At times when things would quiet down we thought they were planning a machette attack which we had to expose ourselves to see if the enemy were sneaking up on us. Lt. Keimling who was in charge of this small post of marines and Guardia National has cheered us up and fought with us as any marine officer would have done, if not much better. All night long we was directing the fight exposing himself to the enemy trying to find where the snipers were and giving us the dope to plug the snipers fire. About 4:25 A. M. we heard the bugler blowing a call but at that time we did not know what kind of call it was, immediately after the firing was letting up and 5 min. after the enemy retreated, this call which we learned later was blown to recall their men and leave the vicinity of their battle. DECLARACIÓN DEL CABO F. CARLSON DE LA BATALLA DE TELPANECA. En la mañana del 19 de septiembre de 1927, estaba durmiendo en el cuartel principal. Me despertó una explosión de una bomba la cual luego descubrí que era una bomba hecha a mano (bomba de dinamita). Me levanté y me puse la ropa para cubrir mis ropas interiores y agarré mi rifle y mi munición, e hice una pausa por mi puesto de mando, que estaba a dos habitaciones debajo de los cuarteles principales, exponiéndome al fuego enemigo. Mientras me zambullía en la habitación, y los hombres estaban en sus puestos de batalla manteniendo a los enemigos fuera con sus disparos; Uno de los hombres me dijo: Al Raso Russell le dispararon, pero nadie supo lo mal que fue herido, unos minutos después nos enteramos de que estaba muerto. El soldado raso Nichols y yo estábamos estacionados por la puerta de entrada frente a la plaza, nos mantuvimos ocupados haciendo tiros a los francotiradores enemigos, que estaban en la iglesia y los árboles. En uno de los edificios de la esquina noroeste de la plaza había una ametralladora Lewis que disparaba en ráfaga a los tres edificios que estaban ocupados por los Marines. A veces, cuando las cosas se tranquilizaban, pensábamos que estaban planeando un ataque con machete lo cual tuvimos que exponernos para ver si el enemigo nos estaba siguiendo furtivamente. El teniente Keimling que estaba a cargo de este pequeño puesto de infantes de Marina y la Guardia Nacional nos estuvo animado y hubo luchado con nosotros como cualquier oficial de Marina habría hecho, si no mucho mejor. Toda la noche estuvo dirigiéndonos en la batalla, exponiéndose al enemigo tratando de encontrar dónde estaban los francotiradores y dándonos información para bloquear el fuego de los francotiradores. Alrededor de 4:25 A. M. escuchamos el cornetín enviando un llamado, pero en ese momento no sabíamos qué clase de llamada era, inmediatamente después de que el fuego fuera menguando y 5 min después de que el enemigo se retiró, este llamado, el cual descubrimos más tarde era entonado para retirar a sus hombres y salir de las cercanías de la batalla. [ p. 2 ] the door, which he did till the fight was over. Pvt. Ruddock who is an automatic man was stationed with me at the rear door of the store-room which we did to the best of our ability. Cpl. Carlsons, Pvt. Nichols were stationed at the front door which they guarded to the best of their ability. The men in the office, Lt. Keimling, Sgt. Eadens, Pvt. Foote, Irwin fought to the best of their ability. The main barracks which had eleven men fought to the best of their ability. En la mañana del 19 de septiembre de 1927, los marines y la Guardia Nacional bajo el mando del teniente Keimling, cuando dormían en sus Cuarteles, fueron atacados por una banda de bandidos que estaban bajo mando del líder rebelde, el General Sandino. Este ataque tuvo lugar a las una de la madrugada cuando estaba tan oscuro que no era posible ver más lejos de delante de uno mismo. Lo primero que nos despertó fue una bomba hechiza que estalló en la parte trasera de nuestros cuartos. El primer tiro que se disparó fue dirigido en el almacén donde los cocineros y mensajeros estaban dormidos. El primer disparo había impactado al soldado raso Russell, que estaba durmiendo cerca de la puerta de entrada, pasó por su cama y por la mía faltando unos cuantas pulgadas para alcanzarme. El soldado raso Russell después de que fue herido saltó y agarró su rifle y disparó tres disparos y fue impactado nuevamente cerca del corazón. Dejó su rifle y se fue a su cama para echarse y morir, lo que hizo unos 3 o 4 minutos después de la lucha comenzó. El teniente Keimling quien estaba a cargo dormía en la habitación de al lado y tan pronto como comenzó la batalla, él se dispuso al trabajo como cualquier oficial de la Marina haría sino mejor. Él animo a los marines y a la Guardia Nacional tanto como cualquier hombre podía en la posición en la que se encontraban. Durante toda la noche se podía oír al teniente Keimling dar órdenes, exponiéndose al enemigo averiguando dónde estaban los francotiradores y dando órdenes a dónde encontrarlos. El tiroteo más pesado fue hecho en los cuarteles de nuestro teniente Keimling. Esta pelea fue con seguridad una de las más duras sobre nuestros hombres, pero con seguridad nosotros nos opusimos a esta y ciertamente hubiésemos amado el ver a nuestros hombres quedarse, tener luz por un momento y así poder mostrarle a Sandino nuestra puntería. El mayor ataque del enemigo se concentró en la parte trasera de nuestros cuarteles, ya que tenían algunas pocas casas y árboles y arbustos para esconderse detrás. Se podía oír a los hombres con machetes que estaban congregados alrededor de los edificios, afilando y golpeando sus machetes contra el edificio y gritaban: (Este por marinos, Viva la Sandino, muere Estados Unidos) Ellos tenían una ametralladora disparándonos desde el oeste del edificio y una ametralladora Sub-Thompson con sus hombres con rifles que disparaban desde el extremo opuesto del edificio, disparando contra nosotros. En la esquina suroeste de nuestros cuarteles se encuentran dos casas situadas donde se encontraba una pandilla estimada entre 40 y 50 hombres gritando y maldeciendo a los marines. De estos dos edificios, ellos arrojaban sus bombas hechas a mano y disparaban una Thompson y una ametralladora Lewis, ellos habían arrojado unas 30 o 40 bombas de esa posición, tenían sus rifles puestos a lo largo de una de las líneas desde el edificio hacia el oeste hasta los edificios en el suroeste. En la parte delantera del edificio, no puedo decir mucho, ya que mi puesto estaba en la parte trasera del edificio, aunque sé que dos ametralladoras Lewis y dos o tres sub-Thompson disparaban desde ese punto. Nuestras estaciones de combate, que se encontraban en tres habitaciones ocupadas por los marines, eran once hombres en el cuartel principal, cinco hombres en la oficina y cinco hombres en el almacén. Cuando la batalla empezó, todos los hombres estaban en sus puestos, algunos de los hombres tenían que bajar de los cuarteles principales a sus puestos de batalla, los cuales estaban bajo fuego pesado en ese momento. El soldado raso Glaser, que también fue asesinado, bajó desde el cuartel principal hasta la oficina que era su puesto, fue fusilado mientras entraba en la habitación. Inmediatamente el teniente Keimling y el Sargento Eadens exponiéndose al enemigo agarraron al soldado Glaser y lo pusieron en la litera para que pudiera descansar tranquilo y durante todas la lucha él estuvo pidiendo agua que le fue dada por el teniente Keimling o el sargento Eadens quienes estaban expuestos a ser impactados por el enemigo. El Sargento Eadens que estaba en la oficina tuvo que subir a los cuarteles principales, pidió que alguien vigilara la puerta. El teniente Keimling me dijo “dame tu rifle, yo vigilaré… [p. 2] la puerta”, lo que hizo hasta que terminó la batalla. El Soldado raso Ruddock, que es un hombre automático, estaba parado conmigo en la puerta trasera del almacén, lo cual hicimos a la mejor de nuestras posibilidades. El Cabo Carlsons, Raso Nichols estaban estacionados en la puerta principal, la que defendieron lo mejor posible. Los hombres de la oficina, teniente Keimling, sargento Eadens, Raso Foote, Irwin lucharon de lo mejor posible. Los cuarteles principales que tenían once hombres lucharon al máximo de sus capacidades. On or about one O'clock September the 19th I was aroused by a loud explosion which afterwards I learned was a bomb thrown by the native rebels under the leadership of General Sandino. I got out of a native bed which I was sleeping on in the storerrom where the cooks and messmen sleep and I put on my clothes and shirt as Lieut. Kiemling had told us to do in any case such as the one that took place. I picked up my belt and two bandoleers and went to the front door which faces the Plaza. The first thing I saw was a native rifleman running around the corner and I afterwards learned that this native was the one who shot and killed Pvt Russell who slept in a bed in the same room. I was on my way to the door when I heard Pvt. Russell exclaim "Oh, slick they got me." Pvt Russell told me that he was hit in the side he fired three shots in the general diretion of the Plaza and returned to his bed where he died shortly afterwards. My post was at the front of the storeroom, Corporal Carlson and myself occupying the door facing the Plaza. The front of the building was fired upon by a Machine (Thompson Sub-Machine Gun) gun and I afterwards learned that it was this gun that hit and mortally wounded Pvt. Glazier. It was quiet in the front except for an occasional burst from the Machine gunner and a sniper who fired about five shots from the church tower. Corporal Carlson and I fired several shots toward the church tower and he stopped fireing [firing] it seemed as though we hit the sniper as he stopped firing so suddenly. It was quiet in the front of the building for the rest of the battle save for an occasional burst of machine gun fire and an enemy sniper on the hill. Privates Handzlik and Ruddock were staioned at the rear door of the storeroom. Pvt. Ruddock had an automatic rifle which was in operation all during the battle. They fought well, firing only when they saw something to fire at saving their ammunition as well as possible. During the battle many bombs exploded in the rear of the building the enemy were firing steadily all the time. I could distinguish three or four machine guns in the rear by their rate of fire. During the battle Lieut. Keimling stood out as a prominent figure as it was he who would urge the Marines and Guardia on to the fight I could hear his voice and it was a great thing to hear him and see him directing the fire and exposing himself, it was he that kept up the Morale of the Marines and Guardia. The most demoralizing thing was the native machete men wheting [whetting] their machetes against the building and yelling "Esta por Marines." The Marines all during the fight were talking back and forth and firing in the direction from where the noises came. These were the outstanding things of the battle. I put down here what happened to the best of my ability and if anything I did not give Lieut. Keimling all the credit he deserves. 21 de septiembre de 1927. Alrededor o a las una de la mañana del día 19 de septiembre, me despertó una fuerte explosión, la que después me enteré de que era una bomba lanzada por los rebeldes nativos bajo la dirección del General Sandino. Salí de una cama nativa en la que dormía en el cuarto del almacén donde los cocineros y los mensajeros duermen y me puse mis ropas y camisa a como nos instruyó el Teniente Kiemling en cualquier circunstancia como la que tuvo lugar. Tome mí cinturón y dos bandoleras, y fui hacia la puerta principal que da a la Plaza. Lo primero que vi fue un fusilero nativo corriendo por la esquina y luego me enteré de que este nativo fue el que disparó y mató al soldado Russell que dormía en una cama en la misma habitación. Yo estaba en mi camino hacia la puerta cuando escuché al soldado raso Russell exclamar: "Oh, demonios me dieron" El soldado Russell me dijo que fue impactado en el lado que detonó tres disparos en la dirección general de la Plaza y regresó a su cama donde murió poco después. Mi puesto estaba en la parte delantera del almacén, el cabo Carlson y yo ocupando la puerta que daba a la Plaza. La parte delantera del edificio fue atacado con una ametralladora (ametralladora Sub-Thompson) y después me enteré de que era esta arma la que impactó e hirió mortalmente al soldado raso Glazier. Estaba tranquilo en el frente, excepto por una ráfaga ocasional del artillero y el francotirador quien detonó unos cinco disparos desde la torre de la iglesia. El cabo Carlson y yo disparamos varios tiros hacia la torre de la iglesia y dejó de disparar, al parecer nosotros alcanzamos impactar al francotirador dado a que dejó de disparar tan de repente. Estaba muy tranquilo en la parte delantera del edificio para el resto de la batalla, salvo por el estallido ocasional de las ráfagas de la ametralladora y un francotirador enemigo en la colina. Los soldados rasos Handzlik y Ruddock estaban colocados en la puerta trasera del almacén. El Soldado raso Ruddock tenía un rifle automático que estabo en funcionamiento durante toda la batalla. Ellos lucharon bien, disparando sólo cuando veían algo a que disparar y racionando sus municiones lo mejor posible. Durante la batalla muchas bombas estallaron en la parte trasera del edificio, el enemigo estaba disparando asiduamente todo el tiempo. Yo podía distinguir tres o cuatro ametralladoras en la parte trasera por su velocidad de tiro. Durante la batalla el Teniente Keimling se destacó como una figura prominente, ya que fue él quien instó a los marines y Guardia a la pelea, yo podía oír su voz y fue una gran cosa oírlo y verlo dirigiendo el fuego y exponiéndose, fue él quien mantuvo la moral de los Marines y Guardias. La cosa más desmoralizadora fue los hombres nativos con sus machetes afilando sus machetes contra el edificio y gritando "Esta por Marines". Los marines durante toda la pelea estaban hablando de un lado a otro y disparando en la dirección de donde provenían los ruidos. Estas fueron las cosas sobresalientes de la batalla. Puse aquí lo que pasó a lo mejor de mi capacidad y sí algo obvie, no le di al Teniente Keimling todo el crédito que se merece. The battle of Telpaneca was on Sunday night about one o'clock the alarm was given when the enemy threw a large bomb just on the outside of the main barracks their [there] was a sentry on guarde [guard] in the rear of [sic] he saw the man jump behind a tree he started to shoot when the bomb went off as soon as the bomb exploded I rused [rushed] in the main barracks and told them to brack [break] out as soon as i hollowed [I hollered] I got my arms which was a tompson [Thompson] submachine gun I rushed to my battle station which was in the office one of the men that was stationed with me was just behind me we started in the door way [doorway] about the same time when some one of the enemy with a tompson [Thompson] machine gun shot in the door way he was the one that killed one of the marines. After the battle started and all the Marines was at their battle stations they sure had to do some hard fighting because all the enemysmen [enemy's men] was drunk and that is why they were so brave the enemy was in [within] 5 and 10 feet of the office their main reason was to wreck the office and kill the Lieutenant that was in command of the post for they think when the commander is dead that we will give in to them but that isn't the Marines way of fighting. Their [There] was a heavy fire on the office for they were throwing bombs they threw about 20 bombs at the office but didnt [didn't] do very much damage to the building. While the battle was at its worst the Lieutenant which name was Lieutenant Kiemling [Keimling] was fireing [firing] a forty five automatic from the doors he would stand between the doors in which the enemy was fireing [firing] through and fire his pistol and throw handgernads [hand grenades] he sure was brave during the battle and fought hard he would keep us in ammunition during the battle crawling a cross [across] the doorways to each one of the men helping them. The Guardia Nacional was fighting hard all during the battle they would rush out on the porch in the open and fire at the enemy their [there] was one man that was an enemy threw a bomb in the Guardia quarters and a Guardia by the name of Galanamca [Raso Justo Salamanca] picked it up threw it out of the building away from the men. The men both Marines and Guardia had a hard battle but they done their part well and saved all the ammunition they [the] best they could for they didn't know how long it would last. The Sargint [Sargent] in charge fought bravely he killed the man that tried to rush in the front door of the ofice and fought all during the battle hard his name was Sargent Eadens. All during the battle the enemy would blow bugle calls for the charges and when the battle was over they blew asemble [assemble] and retreat. The enemy was hollowing [hollering] all during the battle Vava [Viva] Sandino, Vava [Viva] Salgado, Vava [Viva] Sanchez and Vava [Viva] Estrada. I think some of the enemy was of all four generals. I hope this gives you a [an] idea how the battle was. La batalla de Telpaneca fue el domingo por la noche a eso de la una en punto la alarma fue dada cuando el enemigo arrojó una gran bomba justo en el exterior de los cuarteles principales. Había un centinela en la guardia en la parte trasera del cuartel. El vio al hombre saltar detrás de un árbol, el empezó a disparar cuando la bomba explotó, tan pronto como explotó la bomba yo me apresuré en dirección al cuartel principal y les dijo a salieran. Tan pronto como les grite dando la alarma, tomé en mis brazos una ametralladora Thompson, me apresure hacia mi estación de batalla que estaba en la oficina. Uno de los hombres que estaban estacionados conmigo estaba justo detrás de mí, comenzamos en el corredor cuando al mismo tiempo alguien de los enemigo con una ametralladora Thompson disparó hacia el corredor, este fue el que mató a uno de los marines. Después de que la batalla comenzó y todos los infantes de marina estaban en sus estaciones de la batalla, ellos seguro tuvieron que haber dado una dura batalla porque todos los hombres del enemigo eran borrachos y esa era la razón del porqué eran tan aguerridos. El enemigo estaba dentro de unos 5 y 10 pies de la oficina, su razón principal era irrumpir en la oficina y matar al teniente que estaba al mando del puesto, porque piensan que cuando el comandante muere nos cederemos a ellos, pero esa no es la manera de pelear de los Marines. Había un tiroteo pesado en la oficina porque lanzaban bombas. Ellos lanzaron alrededor de 20 bombas en la oficina pero estas no hicieron mucho daño al edificio. Mientras que la batalla estaba en su peor momento, el teniente cuyo nombre era el teniente Keimling, estaba disparando un arma automática calibre cuarenta y cinco desde la puerta en la que estaba instalado entre la puerta en la que el enemigo estaba disparando, y disparando su pistola y lanzó granadas de mano. El ciertamente fue valiente durante la batalla y luchó fuertemente para mantenernos con suficientes municiones durante la batalla, gateando a través de los pasillos hacia cada uno de los hombres, ayudándoles. La Guardia Nacional luchaba duramente durante toda la batalla, ellos salían corriendo por el pórtico al aire libre y disparaban contra el enemigo. Hubo un hombre que era un enemigo, lanzó una bomba en los cuarteles de la Guardia y una Guardia con el nombre de Galanamca [Raso Justo Salamanca] la cogió y la arrojó del edificio lejos de los hombres. Los hombres tanto Marines como Guardia tuvieron una dura batalla pero hicieron bien su parte y guardaron toda la munición a la mejor de sus posibilidades porque no sabían cuánto tiempo duraría la batalla. El Sargento al mando luchó valientemente, mató al hombre que intentó ingresar rápidamente en la puerta delantera de la oficina, y luchó duramente durante la batalla, su nombre era Sargento Eadens. Durante toda la batalla, el enemigo lanzo las llamadas de corneta para la carga y cuando la batalla terminó ellos entonaron la llamada para la retirada. El enemigo estaba gritando fuertemente durante toda la batalla: “Viva Sandino, Viva Salgado, Viva Sánchez y Viva Estrada”. Creo que algunos de los enemigos eran los cuatro generales. Espero que esto te dé una idea de cómo fue la batalla. STATEMENT OF BATTLE OF TELPANECA. At 1:00 a.m. on the 20th of September I was asleep in the Main Barracks when a bomb went off waking me up then the sentry yelled "Break out," I got up and all around the hill the gooks were yelling and firing rifles. I then took my post at the machine gun. There were men all over the square, closing up the barracks throwing bombs and firing their rifles. I got the gun in action driving the gooks back at the same time I was using the machine gun the rest of the Marines were at their post and firing. The Guardia Nationale was firing as fast as they could reload. Capt. H. S. Kiemling was in his command post giving commands to the Guardia and the marines, directing their fire. The Gooks were driven back to where the rifleman could hold the front. Captain Kiemling directed me to take my gun to the rear of the barracks and drive them back. I did and took my post in a doorway in the rear of the barracks. The enemy were close throwing bombs close to the barracks. We opened fire with the machine gun and drove them back to the buildings in rear. The Gook buglers were scattered around blowing charge after charge for the enemy. There was a continuous string of fire between the Marines and the Enemy. Every time the fire slowed up we could hear the Lieutenant's command and asking us how we were and telling us to shoot slower and save our ammunition. From then on till 4:30 in the morning it was continuous fire between the enemy and us at 4:30 retreat blew and the battle ended. 23 de septiembre de 1927. DECLARACIÓN DE LA BATALLA DE TELPANECA. A las 1:00 de la mañana del 20 de septiembre estaba durmiendo en el Cuartel Principal cuando una bomba se disparó despertándome, entonces el centinela gritó "Explosión", me levanté y alrededor de la colina los “gooks” (jerga de militares de EU peyorativa y ofensiva para referirse a los enemigos) gritaban y disparaban rifles. Entonces tomé mi puesto en la ametralladora. Había hombres por todo el cuadro, cerrando el cuartel lanzando bombas y disparando sus rifles. Tomé el arma en acción, conduciendo a los “gooks” de retroceso, al mismo tiempo que utilizaba la ametralladora el resto de los infantes de marina estaban en sus puestos y disparando. La Guardia Nacional estaba disparando tan rápido como podía recargar. El capitán H. S. Kiemling estaba en su puesto de mando dando órdenes a la Guardia y los marines, dirigiendo el fuego. Los “Gooks” fueron dirigidos de retroceso hasta donde el fusilero podía mantener el frente. El capitán Kiemling me ordenó que llevara mi pistola a la parte trasera del cuartel y los llevara de regreso. Lo hice y tomé mi puesto en una puerta en la parte trasera del cuartel. El enemigo estaba cerca lanzando bombas cerca del cuartel. Abrimos fuego con la ametralladora y los llevamos de regreso a los edificios en la parte trasera. Los buglers Gook estaban dispersos alrededor de la carga de soplar después de la carga para el enemigo. Había una hilera continua de fuego entre los marines y el enemigo. Cada vez que el fuego se ralentizaba, podíamos oír el comando del teniente y preguntarnos cómo estábamos y diciéndonos que disparáramos más despacio y guardáramos nuestra munición. A partir de entonces hasta las 4:30 de la mañana fue un fuego continuo entre el enemigo y nosotros a las 4:30 de retiro sopló y la batalla terminó. It was one o'clock Monday morning [19th] and we were awoken when a bomb went off. The sentrys [sentries] came in an [and] hollered break out and all of us were headed for our battle stations. The Battle start[ed], the bandits were fighting with rifles, bomb[s], and mecheatres [machetes], machine guns. The Lieut. in charge was doing every thing in his power to incourage [encourage] us and told us just where the men were situated. There were five mules killed there [they] were at out picket line and the enemy must have cut the wire [to] let them stroll around and in that way they were shot. The Guardia did very fine work at the Battle. One Guardia threw a bomb out of his quarters that had ben [been] threw [thrown] by the enemy. The enemy were making thre [their] charges by the sound of a bugle. The Lieut. in charge all the time the Battle was going on told us to be as sparring [sparing] with ammunition as we could as we did not have much. The Battle went on until 4:30 a.m. and retreat went at 4:30 a.m. and they vacated. Sargent Eadens did very good in the Battle. He came from one of the building[s] to the other during the battle to fix the stoppages and refilled Lewis machine gun drums. Era la una de la mañana del lunes (19) y fuimos despertados cuando una bomba explotó. Los centinelas vinieron y gritaron Explosión y todos nosotros nos fuimos dirigidos a nuestras estaciones de batalla. La batalla comenzó, los bandidos luchaban con rifles, bombas, y machetes, ametralladoras. El teniente a cargo hacía todo lo posible para motivarnos y nos decía dónde estaban los hombres situados. Hubo cinco mulas asesinadas allí, ellas estaban en cerca y el enemigo debió haber cortado el alambre para permitirles deambular y de esa manera les dispararon. La Guardia hizo un trabajo muy bueno en la batalla. Un Guardia arrojó una bomba de sus aposentos que había sido lanzada por el enemigo. El enemigo hacían sus ataques al sonido de un clarín. El teniente a cargo, durante todo el tiempo de la Batalla, estuvo diciéndonos que fuéramos como racionales con las municiones a como pudimos ya que no teníamos mucho. La batalla continuó hasta las 4:30 de la mañana y el retiro fue a las 4:30 de la mañana y ellos se fueron. Sargent Eadens hizo un buen desempeño en la batalla. Vino de uno de los edificios al otro durante la batalla para arreglar los atascos y rellenar los tambores de metralleta Lewis. HEADQUARTERS SECOND BRIGADE MARINE CORPS. The Commander Special Services Squadron. 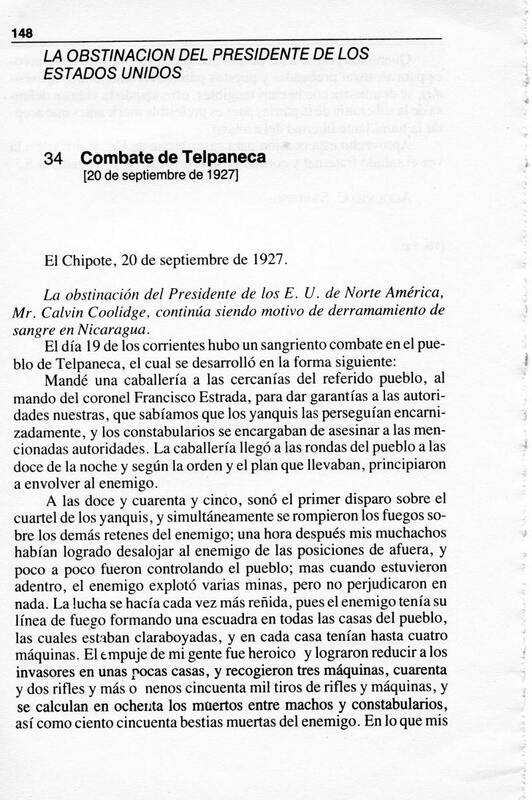 Report on defense of TELPANECA, Nicaragua, on 19 September 1927. 1. 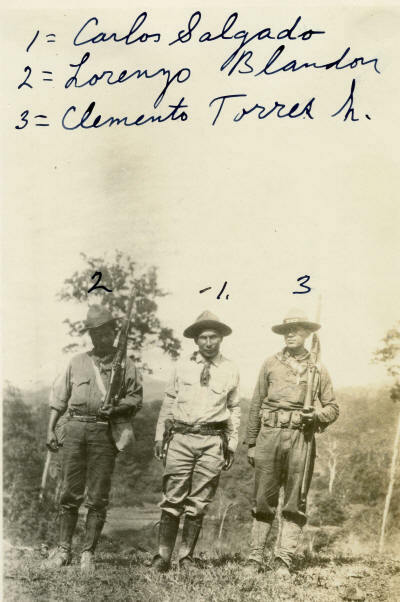 There are transmitted herewith copies of statements of First Lieutenant Herbert S. Keimling, U.S. Marine Corps, and seven of the members of his command, describing the successful defense of TELPANECA, Nicaragua, on the night of 18-19 September, 1927, against a force of bandits, greatly superior in numbers. 2. The defending force consisted of one Marine Officer Twenty (20) enlisted Marines and Twenty-five (25) enlisted of the Guardia Nacional de Nicaragua. SEDE DE LA SEGUNDA BRIGADA DEL CUERPO DE LA MARINA. 21 de octubre de 1927. El Comandante del Escuadrón de Servicios Especiales. 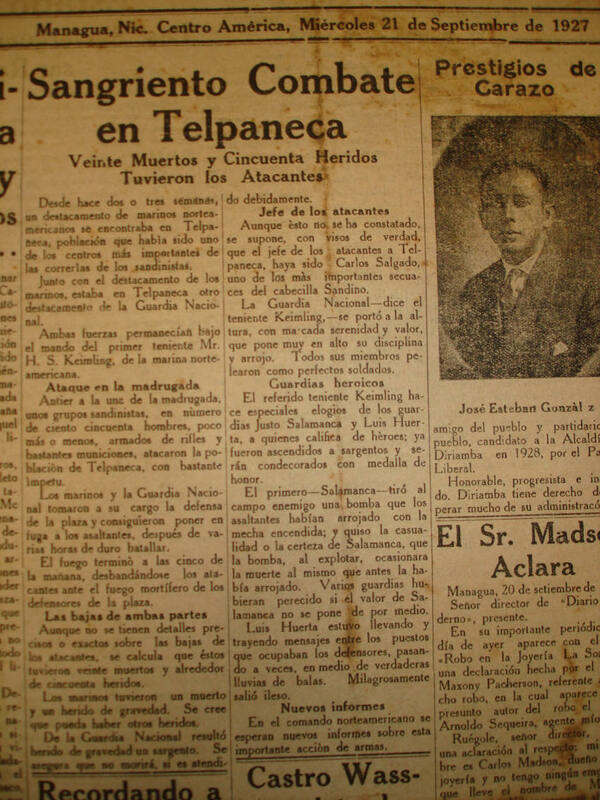 Informe de la defensa de TELPANECA, Nicaragua, el 19 de septiembre de 1927. 1. Se transmiten copias de las declaraciones del Primer Teniente Herbert S. Keimling del Cuerpo de Marines de los Estados Unidos y de siete miembros de su mando, describiendo la exitosa defensa de TELPANECA, Nicaragua, en la noche del 18 al 19 de septiembre de 1927, contra una fuerza de bandidos, muy superior en número. 2. La fuerza defensora consistía en un oficial de Marina de veinte (20) Marines enlistados y veinticinco (25) enlistados de la Guardia Nacional de Nicaragua. The obstinacy of the President of the United States, Mr. Calvin Coolidge, continues to be the cause of the shedding of blood in Nicaragua. On the 19th of the present month there was a bloody battle in the village of Telpaneca, which came about in the following manner. I ordered a cavalry unit to the edge of that town under the command of Colonel Carlos Estrada, in order to provide protection to our authorities, because we knew the Yankees were pursuing them pitilessly, and that the constabularies [Guardia Nacional] were under orders to murder those same authorities. Our cavalry arrived on the outskirts of the town at twelve o'clock at night and, in accordance with their order and the plan they had been given, they began to encircle the enemy. At 12:45 the first shot rang out against the enemy barracks, and simultaneously firing began against the other enemy units. An hour later my men had managed to dislodge the enemy from their outer positions, and little by little they were gaining control of the village. But when they had gotten into the town the enemy exploded some mines, though without doing any damage. The struggle became even more hard-fought, because the enemy had their line of fire in the form of a square in all the village houses with their high windows, and in each house there were four machine guns. The thrust of my people into the village was heroic, and they managed to reduce the invaders to a few houses and to capture three machine guns, forty-two rifles, and about fifty thousand rounds of ammunition for rifles and machine guns, and the number of dead among the machos [Marines] and the constabularies was reckoned at eighty. Concerning my men, they amused themselves by collecting supplies from the forward barracks. Dawn came, and they had to retire to the sound of the trumpet, or rather before the famous ball that is the sun. The eighty deaths of which I speak were those of the enemy alone. Fuente: Augusto C. Sandino, El pensamiento vivo, tomo 1 (Managua: Ed. Nueva Nicaragua, 1984), pág. 148-49. 27.09.21. Ancillary Document No. 2: Diario Moderno (Managua), "Sangriento Combate en Telpaneca"
Note: This report describes a follow-up EDSN attack two days later that lasted a little over an hour and apparently resulted in no casualties on either side. 1. At 2045 21 September 1927, rifle and sub-thompson firing commenced at Telpaneca, Nic., on a hill slope occupied by Guardia Nacional. The Marines and Guardia immediately repaired to their battle stations and all lights in our barracks were extinguished. Several shots were fired at the barracks. Fire was returned at figures noted to be moving about. An attempt was made by enemy to gain the tower of the church for sniping locations but failed due to our prompt fire. The enemy endeavored to force their way into some private buildings in rear of Guardia Barracks but were frustrated by the quick action of the Guardia. Several of them were routed by Guardia when an effort was made to gain admission into native houses strategically located. Enemy retreated to river and firing ceased at 2200 which was mostly sniping. All hands stood by their battle stations the remainder of the night but no further action occured. 2. The Marines and Guardia took their stations orderly and were instantly ready to engage the enemy. All officers and men were commendably cool and quiet during the brief engagement and due to this condition and prompt action it is believed that a similar attack to the one made on the 19th instant was warded off. 3. No casualties occurred to our forces or trace to the enemy. No casualties amonst non-combatants. No damage or loss to priave or public property. 4. Bandit leader of the attack was reported as Francisco Garcia. 5. The following offer [officers] and men of the Marines and Guardia took part in the attack. Captain H.S. Keimling, G.N. de N in command at Guardia Barracks, Lt. Bellinger, USMC in charge of marine quarters. Lt. Waterman, USMC, second in command assisting CO at the command post. Nichols, V.L. Cpl. Carlson, F.
27.09.22. DOC AUXILIAR NÚM. 3: DECLARACIÓN DEL ATAQUE DE TELPANECA 21 DE SEPTIEMBRE DE 1927 POR tNT. H.S. KEIMLING. Nota: Este informe describe un ataque siguente dos días después, de 8.45 PM hasta 10 PM el 21 de septiembre. Por el Teniente H.S. Keimling. 1. A las 2045 del 21 de septiembre de 1927, disparos de rifle y sub-thompson comenzaron en Telpaneca, Nic., en una pendiente de la colina ocupada por la Guardia Nacional. Los Marines y la Guardia se desplegaron inmediatamente a sus puestos de batalla y todas las luces en nuestros cuarteles se extinguieron. Se realizaron varios disparos contra los cuarteles. El fuego fue devuelto a las figuras que se notaban en movimiento. Un intento fue hecho por parte del enemigo en tomarse la torre de la iglesia para ubicación de sus francotiradores pero falló debido a nuestro pronto fuego. El enemigo se esforzó por entrar en algunos edificios privados en la parte trasera de los cuarteles de la Guardia, pero fueron frustrados por la acción rápida de la Guardia. Varios de ellos fueron interceptados por la Guardia cuando un esfuerzo se hizo para ganar admisión en las casas nativas situadas en lugares estratégicos. El enemigo se retiró hacia el río y el fuego cesó a las 22.00 horas, el cual fue en su mayoría de francotirador. Todas las manos permanecieron junto a sus estaciones de batalla el resto de la noche, pero no ocurrió ninguna otra acción. 2. Los Marines y la Guardia tomaron sus puestos ordenadamente y estaban al instante prestos para combatir al enemigo. Todos los oficiales y todos los oficiales y hombres estuvieron reconocidamente tranquilos y silenciosos durante el breve combate y debido a esta condición y pronta acción, se consideró que un ataque similar al que fue hecho el 19 fue mantenido a raya. 3. No ocurrieron bajas de nuestras fuerzas ni rastros de enemigo. No hay víctimas entre los no combatientes. Ningún daño o pérdida a la propiedad privada o del público. 4. El líder de los bandidos del ataque fue reportado como Francisco García. 5. La siguiente oficiales y hombres de los Marines y la Guardia participaron en el ataque. Capitán H.S. Keimling, G.N. de N (Nicaragua) en el mando de los cuarteles de la Guardia, el teniente Bellinger, USMC a cargo de los cuartos marinos. El teniente Waterman, USMC, segundo al mando que asiste al CO en el puesto de mando. 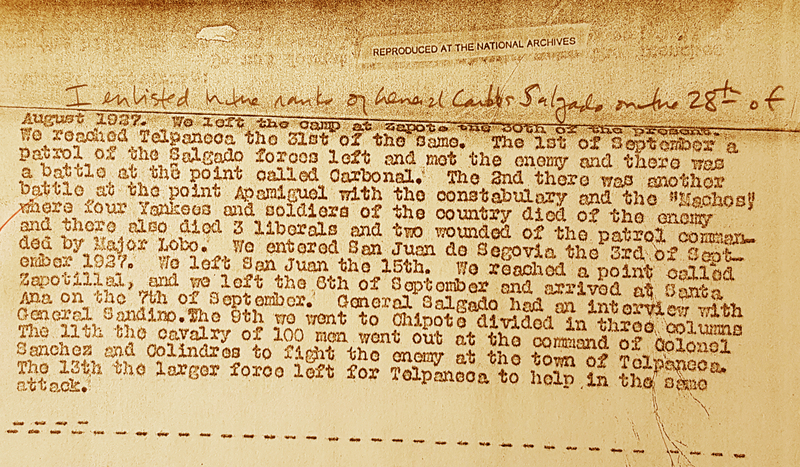 Note: This English-language translated fragment of an anonymous diary kept by a Sandinista soldier who took part in the attack on Telpaneca on 19 September 1927 was seized by Marine Corps Captain Maurice Holmes in early April 1928, during a complex series of assaults on the Sandinista strongholds in the area around El Chipote (see PC-DOCS > 1928: 2 > 28.04.08 Holmes, or www.sandinorebellion.com/PCDocs/1928a/PC280408-Holmes.html ). English translation only. The original letters have not been found. Holmes's report of his seizure of this and other documents in early April 1928 is included as an addendum to this diary fragment. I enlisted in the ranks of General Carlos Salgado on the 28th of August 1927. We left the camp at Zapote the 30th of the present. We reached Telpaneca on the 31st of same. The 1st of September a patrol of the Salgado forces left and met the enemy and there was a battle at the point called Carbonal. The 2nd there was another battle at the point Apamiguel with the constabulary and the Machos where four Yankees and soldiers of the enemies of the country died, and there also died three Liberals and two wounded of the patrol commanded by Major Lobo. We entered San Juan de Segovia the 3rd of September 1927. We left San Juan the 15th. We reached a point called Zapotillal, and we left the 8th of September and arrived at Santa Ana on the 7th of September. 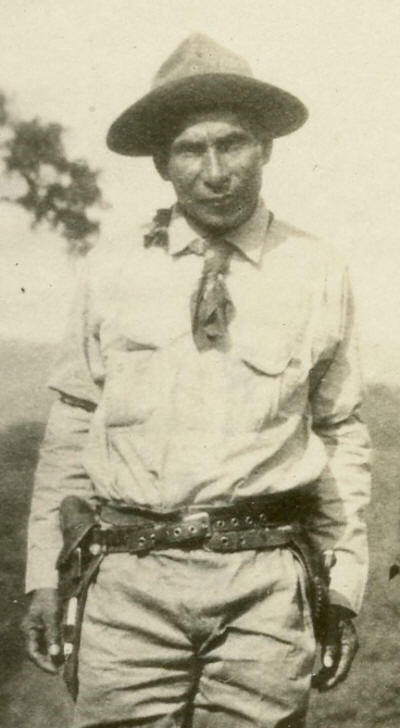 General Salgado had an interview with General Sandino. The 9th we went to Chipote divided in three columns. The 11th the cavalry of 100 men went out at the command of Colonels Sanchez and Colindres to fight the enemy at the town of Telpaneca. The 13th the larger force left for Telpaneca to help in the same attack. Source: Record Group 127, Entry 43A, Box 29, U.S. National Archives. From: CO 52nd Company, GUIGUILI. April 6, 1928. 1106 At 1045 April 5, fired on three men fleeing into bush from house, one fleeing into bush from house, one seen to bear firearm. Wounded one, all escaped. Found cached in bush around house: 1 shotgun with powder and ball, 11 fighting machetes, several axes, leg irons for pole climbing, saddle with Sandino colors in bands, quantity of native clothing and blankets, two houses contiguous to caches had quantity of beans, corn, and bananas. 1530 Man found spying our movements, following in canoe on Cua River in direction of Cua. 2nd Lt. Norman and squad attempted capture. Native fled, squad fired and pursued. Native fled through house in which were found muzzle loading carbine, powder and ball, hat with Sandino colors. From: CO. 52nd Company Guiguili. April 8, 1928. 1108 While enroute here from Guiguili, at 1345, point fired on party of 3 natives, one of whom wore khaki and carried a rifle, all mounted. Natives fled, one quitting a gray mule, brand U.S. boot number 245. On mule was native saddle carrying pair of regulation (our) saddle bags in which were 7 cartridges, .50 caliber, Krag (RA 17), One 11 Field Message Book, U.S.M.C. Condiment can contained notes only, in number, 7 signers, including Coronado Maradiaga. Also found muzzle loading shotgun in same house. Have been occupying house of Eduardo Palma for which section is named Guiguili. Found there on 7th. additional caches of 500 pounds of beans and smaller articles bringing total there approximately 2100 pounds. Also found full bandolier Krag ammunition. Withheld burning house to keep as quarters stop. Holmes 1700. Strength patrol Capts. Holmes and Phipps, 40 enlisted one (1) Navy. 1100. Me enlisté en las filas del General Carlos Salgado el 28 de agosto de 1927. Salimos del campamento de Zapote el día 30 del presente. Llegamos a Telpaneca el día 31 de la misma. El 1 de septiembre una patrulla de las fuerzas de Salgado salió y se encontró con el enemigo y hubo una batalla en el punto llamado Carbonal. El dos de Septiembre hubo otra batalla en el punto Apamiguel con la Guardia y los Machos, donde murieron cuatro yanquis y los soldados enemigos del país, y también murieron tres liberales y dos heridos de la patrulla comandada por el mayor Lobo. Ingresamos a San Juan de Segovia el 3 de septiembre de 1927. Salimos de San Juan el día 15. Llegamos a un punto llamado Zapotillal, y salimos el 8 de septiembre y llegamos a Santa Ana el 7 de septiembre. El general Salgado tuvo una entrevista con el General Sandino. El día 9 fuimos al Chipote dividido en tres columnas. El 11, la caballería de 100 hombres salió al mando de los coroneles Sánchez y Colindres para combatir al enemigo en la ciudad de Telpaneca. El 13, la fuerza mayor se fue para Telpaneca para ayudar en el mismo ataque. Fuente: Registro del Grupo 127, Entrada 43A, Recuadro 29, Archivos Nacionales de los Estados Unidos. De: CO 52ava Compañía, GUIGUILI. 6 de abril de 1928. 1106 A las 1045 del 5 de abril, dispararon contra tres hombres que huían de los matorrales desde una casa, uno huía de la casa a un arbusto, uno considerado que portaba arma de fuego. Herido uno, todos escaparon. Encontrado oculto en los arbustos alrededor de casa: 1 escopeta con pólvora y perdigones, 11 machetes de combate, varios hachas, anclas de hierro para escalar, sillas de montar con bandas con los colores de Sandino, cantidad de ropa nativa y mantas, dos casas contiguas a lugar de escondite tenían cantidad de frijoles , El maíz y los plátanos. 1530 Hombre encontrado espiando nuestros movimientos, siguiendonos en canoa en el río Cua en dirección al Cua. El segundo teniente Norman y el escuadrón intentaron capturarlo. Nativo huyó, el escuadrón disparo y persiguió. Nativo huyó a través de la casa en la que se encontraron carabina amordazada cargada, pólvora y perdigones, y sombrero con colores Sandino. De: CO. 52ª Compañía Guiguili. 8 de abril de 1928. 1108 Mientras nos encaminamos desde aquí de Guiguili, a las 1345, apuntamos fuego a un grupo de 3 nativos, uno de los cuales vestia khaki y portaba un rifle, todos montados. Los nativos huyeron, uno de ellos dejando una mula gris, marcada estadounidense en la bota con el número 245. En la mula estaba ensillada nativamente portando un par de regulación (nuestras) bolsas de montar en la que habían 7 cartuchos, 50 calibre, Krag (RA 17) , una 11 cuaderno de mensajes de campo, Condimento de USMC que sólo puede contener notas, en número, 7 firmantes, incluyendo Coronado Maradiaga. También se encuentró carabinas cargandas y escopeta en la misma casa. Habiendo ocupando la casa de Eduardo Palma para la cual dicha sección se llamó Guiguili. Encontrado allí el 7. Adicionales almacenamientos de 500 libras de frijoles y artículos más pequeños, con un total de aproximadamente 2100 libras. También se encontró munición completa Krag de bandolera. La casa retenida quemada para tenerla como punto a los escuadrones. Holmes 1700. Patrulla de fuerza de Capitán Holmes y Phipps, 40 enlistados una (1) Marina. 1100. 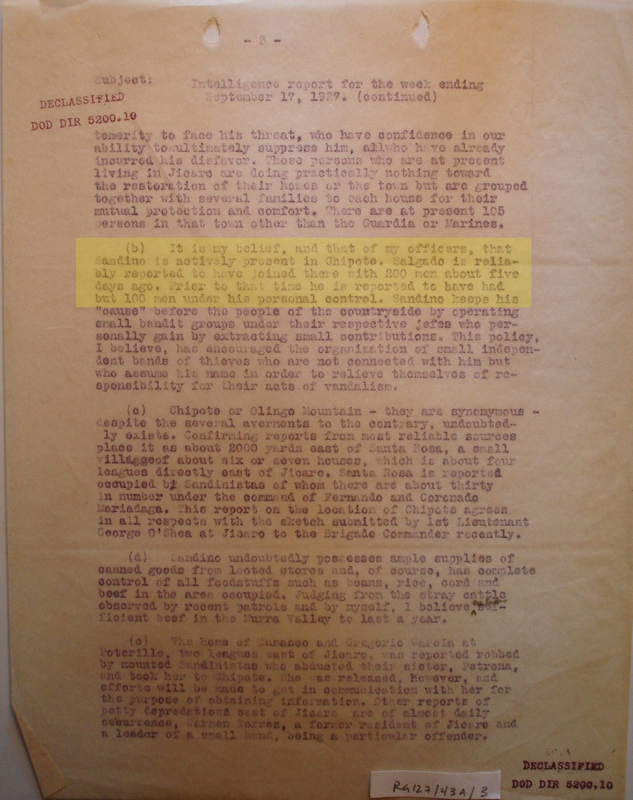 Note: This excerpt of an intelligence report of Sept. 17, 1927 is apparently based on the reports of spies, who "reliably reported" that Gen. Carlos Salgado joined Sandino at El Chipote around Sept. 12 ("about five days ago" in a report dated Sept. 17). According to the anonymous diary quoted above, Salgado's forces joined Sandino at El Chipote on Sept. 9 — a difference of only three days. Also worth noting is that the EDSN was formally founded on Sept. 2. My best read of these fragments is that Salgado and his troops joined Sandino at El Chipote a week or so after the founding of the EDSN, and together Salgado and Sandino developed a plan for Salgado and his forces to attack the Marine-Guardia garrison at Telpaneca later in September. It is my belief, and that of my officers, that Sandino is actively present in Chipote. Salgado is reliably reported to have joined there with 200 men about five days ago. Prior to that time he is reported to have had but 100 men under his personal control. Source: First Lt. Glenn E. Hayes, Commanding Officer, Ocotal, Intelligence report for the week ending September 17, 1927, p. 2, NA127/43A/3. Nota: Este es un extracto de un informe de inteligencia del 17 de septiembre de 1927 y se basa aparentemente en informes de los espías, que "informaron fiablemente" que el General Carlos Salgado se unió a Sandino en El Chipote cerca del 12 de septiembre ("hace unos cinco días" en un informe fechado el 17 de septiembre). Según el diario anónimo citado anteriormente, las fuerzas de Salgado se unieron a Sandino en El Chipote el 9 de septiembre, una diferencia de sólo tres días. También vale la pena destacar que el EDSN fue formalmente fundado el 2 de septiembre. Lo mas destacado de estos fragmentos es que Salgado y sus tropas se unieron a Sandino en El Chipote una semana después de la fundación del EDSN y juntos Salgado y Sandino desarrollaron un plan para que Salgado y sus fuerzas atacaran la guarnición de Guardia Marítima-Guardia en Telpaneca más tarde en septiembre. Es mi opinión, y la de mis oficiales, que Sandino esté presente activamente en Chipote. Se ha informado que Salgado se le ha unido con 200 hombres hace unos cinco días. Antes de ese tiempo se informa que había tenido sólo 100 hombres bajo su control personal. Fuente: First Lt. Glenn E. Hayes, Commanding Officer, Ocotal, Intelligence report for the week ending September 17, 1927, p. 2, NA127/43A/3. • Some fascinating details here. • Numerous instances showing spirited energy & passion, even recklessness, of EDSN attackers, and equally passionate & determined defense of garrison by Marines & native Guardia. • Intense mutual hatred, so evident later in the war, infuses soldiers' statements. Beginnings of another longstanding pattern: EDSN's failed efforts to convince native Guardia to join them & turn on the Marines. • Reports suggest mutual hatred (Sandinistas vs. Marines-GN) developed and hardened from the war's earliest stages. • Also suggest that the process of Guardia identity formation was well underway, with combat key in forging that sense of identity. • Algunos detalles fascinantes aquí. • Numerosos casos que muestran energía y pasión, incluso imprudencia, de los atacantes del EDSN, y la defensa igualmente apasionada y determinada de la guarnición por los Marines y la Guardia nativa. • El intenso odio mutuo, tan evidente más tarde en la guerra, infunde las declaraciones de los soldados. • El principio de otro patrón de larga data: los esfuerzos fallidos de EDSN para convencer a la Guardia nativa de unirse a ellos y encender a los Marines. • Los informes sugieren que el odio mutuo (Sandinistas vs. Marines-GN) se desarrollaban y endurecían desde las primeras etapas de la guerra. • También sugieren que el proceso de formación de la identidad de Guardia estaba bien encaminado, con el combate clave para forjar ese sentido de identidad.